Bring a large saucepan of water to a steady simmer. Stir in the white wine vinegar. Crack the eggs into cups and slide into the simmering water. Simmer for 3 minutes, adjusting the temperature as needed to keep the water at a steady simmer. Remove from the water with a slotted spoon to a plate lined with paper towels. Cover loosely with aluminum foil to keep warm. Toast the bread in a toaster or under a hot grill. 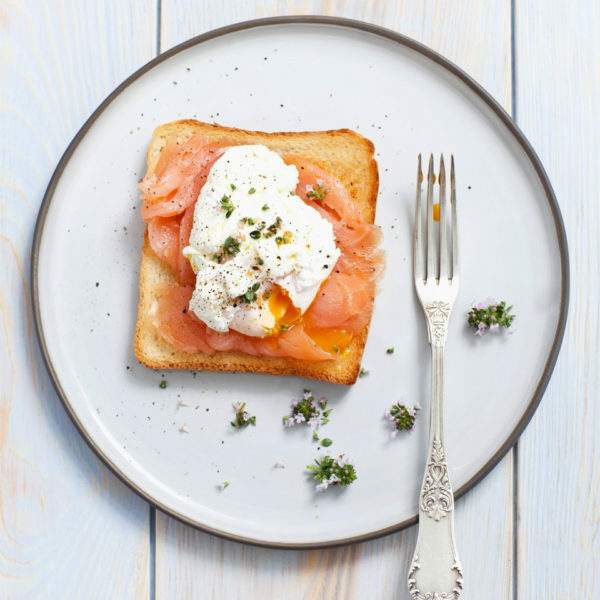 Arrange between serving plates and top with the smoked salmon. Squeeze over a little lemon juice. Top with the poached eggs, seasoning them with salt and freshly ground black pepper to taste. Garnish with chopped thyme before serving.